Last October, University of Michigan president Mary Sue Coleman announced that the School of Music, Theatre & Dance had received an $8 million gift that would have a transformational effect on North Campus by “expanding the U-M environment for creative work and creative approaches.” The gift was from William K. and Delores S. Brehm (Bill and Dee), longtime supporters of U-M, who had come to realize that they could make the biggest difference to the largest number of students at the School of Music, Theatre & Dance by supporting a major renovation and expansion of the Earl V. Moore Building, one of SMTD’s primary facilities. Self-identified as not being “brick and mortar people” (“We’re not looking to have our names on a building,” said Bill), the Brehms nevertheless made this generous gift because they had done their homework: they had spent years getting to know Dean Christopher Kendall, Professor Jerry Blackstone, and many others at SMTD, and had learned a great deal about what makes a great performing arts school. While having and supporting exceptional faculty and students is the primary focus of such an institution, having and maintaining the best possible facilities—allowing faculty and students to work to their highest potential—is another critical priority. “Excellent space for practice, performances, and teaching is essential to the development of artists and scholars in the performing arts,” said Dean Kendall. The Brehm's gift is a catalyst and crucial contribution toward the total $23 million cost of renovating and expanding the Moore Building, SMTD's original North Campus home. Of the total cost, $14 million is allocated from the University, with the balance to come from additional fundraising, including a gift from Glenn E. Watkins, emeritus professor of musicology, which will provide for a state-of-the-art lecture hall as part of the expansion. Construction for the project will commence in early 2014 and is expected to be completed in about two years. The updates that will be made to the 1964 building are extensive. Critically, there will be a significant improvement in the size and acoustical properties and a 25 percent increase in the number of practice rooms, providing performance majors space to fulfill the hours of daily practice essential to their development. There will be a number of new faculty offices and classrooms, a state-of-the art lecture hall, and a suite of percussion practice rooms, teaching studios, and rehearsal spaces, while large ensembles will benefit from a new, expansive, and high-volume rehearsal hall. The existing rehearsal hall, McIntosh Theatre, and Britton Recital Hall will undergo significant improvements in acoustics, aesthetics, and functionality, and will be made more accessible thanks to a new lobby area in the south wing that will give the Moore building a light, welcoming, and capacious public entry area. Since then, however, the School has expanded in unforeseen ways: the departments of musical theatre, jazz, and performing arts technology were added to the existing music departments, while the Department of Dance and the Department of Theatre & Drama joined forces with the School of Music (in 1974 and 1984 respectively) to create an interdisciplinary performing arts school. As a result, enrollment at SMTD has nearly doubled, as has the faculty, since planning for the Moore Building first began in 1950. Over the years, the Moore Building has reconfigured many of its original office and practice spaces to accommodate for growth and the changing learning environment. It now contains a Surround Lab, a studio designed for surround-sound audio mixing and research, electronic composition, multimedia projects, and multi-track recording; the Music Computing Site, outfitted with dozens of computer stations to provide the listening resources needed for SMTD classes; and the Music Technology Lab (MTL), a classroom with 11 student computer stations and instructor station equipped with video projection capability. With the opening of the Walgreen Drama Center in 2007, home of the Arthur Miller Theatre and Stamps Auditorium, theatre and musical theatre students and faculty were united with the music departments on North Campus. The new building provided much-needed and completely up-to-date rehearsal, performance, and production facilities, as well as office and classroom space. The effort to unite Dance with the other performing arts disciplines on North Campus continues. Now, with the planned renovation and expansion of the Moore Building, state-of-the-art facilities will be available to music students. The proposed architect of record for the project is Integrated Design Solutions (IDS) of Troy, Michigan; Ennead Architects of New York City is the project's design architect. Kirkegaard Associates, one of the preeminent acoustic design firms in the country, serve as the acousticians. Ennead has designed performing arts projects at Stanford University (Bing Concert Hall), Carnegie Hall, and the Frank Sinatra School of the Arts in New York. They were also part of the architectural team that designed U-M's A. Alfred Taubman Biomedical Science Research Building. IDS, which earned the 2012 AIA Michigan Firm of the Year, was part of the architectural team that renovated and expanded the University of Michigan Museum of Art. This is not the first renovation the Moore Building has undergone, but it will be the most extensive. 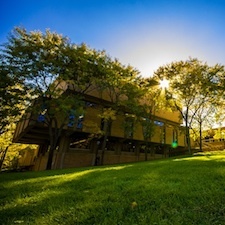 In 1985, the Margaret Dow Towsley Center was added, made possible in part by generous support from the Harry A. and Margaret D. Towsley Foundation. This new addition contained the Blanche Anderson Moore Organ Hall and McIntosh Theatre, the latter designed primarily for opera and musical theatre. Two such spaces had been in Saarinen’s original concept for the building—the large recital hall was cited as a necessity in the original 1950 proposal for the building—but they were eliminated for lack of funds. The renovations made in 1985 addressed a number of critical issues in the Moore Building. Now, after 28 years of additional growth and unprecedented evolution in the field of music, the School is again poised to address many of the facility challenges that have since arisen in its core music program.